Hairy Buchnera is an erect annual herb, 15-20 cm high, with slender, hairy stem. Lower leaves are opposite, while the upper ones are alternately arranged. The leaves are narrlow-linear, 3-5 cm long, with toothed margin, and gradually become floral bracts as one moves up the stem. Stalkless flowers occur distantly arranged on a spike, 15-20 cm long, at the end of the stem. 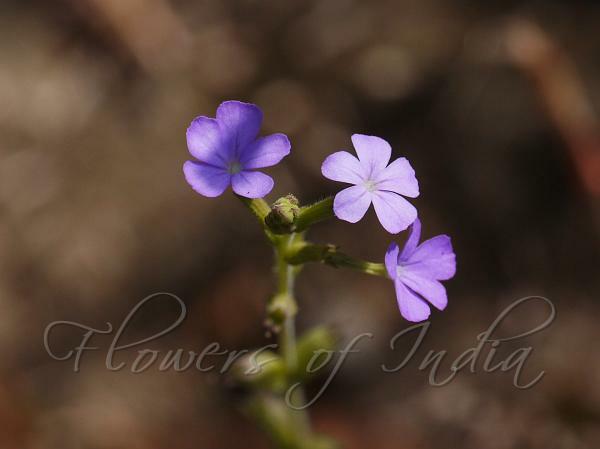 Flowers are violet-purple, 1 cm, with five obovate petals, 3 mm long, notched at the tip. Karanki is found in the grasslands of Konkan region. Flowering: October. Identification credit: Prashant Awale Photographed in Hadsar & Matheran, Maharashtra.